AOS Corrugated Truss Files - GS Direct, Inc. Contains "trussed interior for exceptional stacking strength. Modular design for easy relocation in office. End access for easy retrieval when stacked. Labeled integral end flap for easy identification and organization. Attractive corrugated cardboard with dark gray lettering on white background. 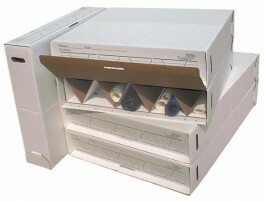 The ideal solution for stackable easy to access rolled drawings, prints, artwork and maps. Two units per carton shipped flat for a total of 18 compartments per carton (14 of the compartments store up to 4" rolls and 4 store up to 2 1/2" rolls). Canon & HP Ink Cartridge Clearance! Dusting Brushes 10" or 15 1/2"
Berkeley Classic Combos 30" x 42"